Prices of long steel manufacturers have remained rather stagnant over the past 3 months with the exception of Ann Joo & Southern Steel after a meaningful run up among the steel makers in July 2009. Where will the prices go from here? My opinion is that share prices will head upwards, albeit at a more moderate pace, backed by recovery in global economy and the various stimulus measures undertaken by governments worldwide. However, the snag could be the overcapacity in the market, potential cutting down of stimulus packages and slower than expected global economic recovery. What's the situation in China? To monitor regional steel prices, China plays a major role in determining the direction of its price as China's steel production make up to about 50% of world's steel production. 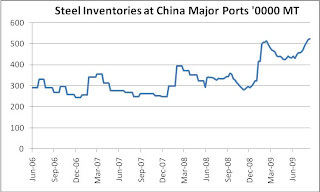 To recap, China steel prices surged by 42% from RMB3,100/MT in Mar 2009 to RMB4,400/MT in mid-Aug, owing to stimulus measures which encouraged property investments and easy lending to the construction and steel sector. 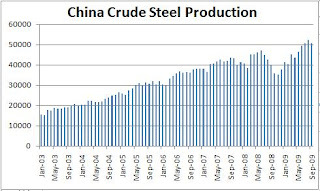 Consequently, steel production also rose from 35.2 mil MT in Nov 2008 to 52.3 mil MT in Aug 2008. 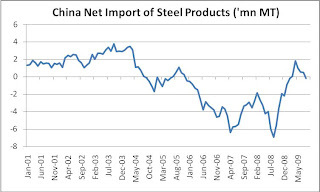 However, due to the rising inventories coupled with declining trend as net importer of steel, China steel prices plunged from RMB4,400/MT in mid-Aug to about RMB3,700/MT currently. Better days ahead? 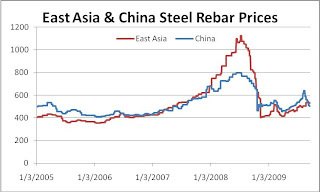 Hopefully..Going forward, China's contribution to steel demand should see steel prices improve. With RMB4 trillion stimulus package in place, of which a large portion goes to infrastructure spending while complemented by prudent macroeconomic policies, China's economy should perform more robustly. 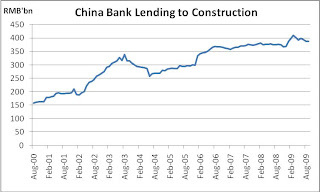 China's real GDP might expand by 8% in 2009 and even higher in 2010. Compounded by China's plans to regulate and consolidate the steel sector by putting a cap of 460 million MT production capacity by 2011 from current capacity of more than 600 million MT capacity should bode well for the steel industry and shore up steel prices. Adding on, stimulus measures and monetary easing implemented worldwide could see global steel demand rebounds back to 2008 levels by 2010. 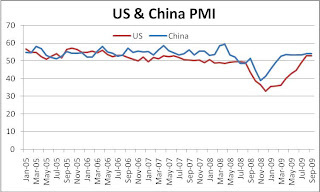 We are already seeing US & China PMI at an increasing trend, signalling a rebound in the manufacturing sector which will lift demand for flat steel. Local demand: Looking ahead into 2010, local pump priming activities with upcoming projects worth an estimated RM70 billion such as LRT projects, LCCT, double tracking and Pahang-Selangor Water Transfer projects should lend support to the local steel makers. Still Neutral despite improving fundamentals as local players remain cautious in near term: Looking at the fundamentals of the steel industry, upside potential is more likely to materialize in the longer horizon into 2010. 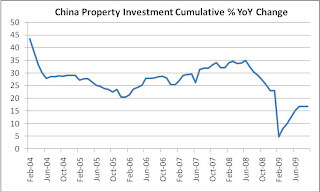 The reason being prices are expected to remain soft in the near term owing to high inventory buildup as supply outstrips demand coupled with China's capacity remaining high. Risks of slower economic recovery and cutting down of stimulus measures remain present which will further impede demand growth. As such, local steel millers are still cautious on the potential outlook as seen from their inventories which remain low to rebuild their capital. Ann Joo (RM2.64) & Kinsteel (RM0.97): Not much upside - Current price quite expensive with PER 2010 in the teens. Somehow I cannot justify attaching PER of >10x to steel millers as their earnings remain volatile with high operating and financial leverage. Nonetheless, Ann Joo exports are rather impressive this year, increasing its exports to 50% of its manufacturing revenue as compared to 30% previously. Adding on, their commencement of mini blast furnace next year will be able to produce cost savings and added capacity, which will increase next year's margins. Southern Steel (RM1.95), Lion Industries (RM1.46) & Masteel (RM1.04): Cheap - PER 2010 at 4-6x. Southern steel's business remains conservative with diversified operations along the value chain. There has been some interests on Hong Leong companies, played up by the boss, Quek family. Since Southern Steel is part of Hong Leong Group, their shares might get rather buoyant. Masteel recently secured a deal with Stemcor Australia to supply RM120 million worth of steel bars to Australia over 2 years. This will be a milestone for Masteel to venture into the huge export market as exports contributed less than 10% to their sales in the past. This deal alone already represents about 12% of the projected sales for the next two financial years. In addition, industry sources indicated that exports to Australian market may provide better margins compared to domestic market, good for Masteel earnings. For Masteel earlier media release on this deal, click here. Disclaimer: The above article does not represent an investment advisory service as no subscription or management fees are charged. The contents of the article are provided as general information only and should not be taken as investment advice or as a recommendation to buy or sell any security or financial instrument. Any investment decisions carried out based on information, analysis, or commentary provided above is solely your responsibility. You should consult your investment adviser before making any investment decisions. Supermax (RM3.60) in the headlines again! Yeah!! !